Learn how to create custom lettering and type-based logos from regular fonts. Texture Styles are part of T-Shirt Design Master Collection 2. Using the T-Shirt Squares template in Photoshop. With the help of Every Day Textures for Illustrator, Photoshop, and Affinity. The Every Day Textures Collection is also included in T-Shirt Design Master Collection. A collection of 42 Analog Halftone brushes, textures, and patterns from the mid-1960's - created the old-school way. Analog Halftones will work with anything you can dream up in Photoshop, Illustrator, Procreate App for iPad Pro, Affinity Designer & Photo. Hula designs for VOODOO, @aloha_vancouver and another project yet to be announced. 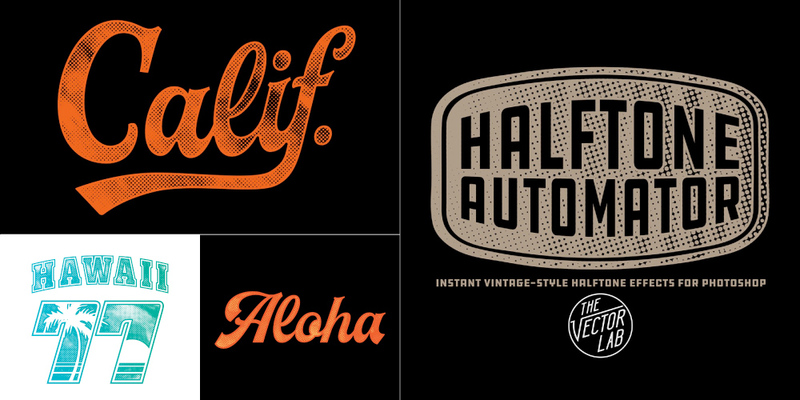 Inspired by 1950’s matchbooks and Hawaii tourism materials. Drawn with the Procreate App for iPad Pro. Did you know: Luxury Grunge Textures are also part of T-Shirt Design Master Collection 2, a huge bundle of t-shirt design resources. What are Luxury Grunge Textures? This is a collection of 39 gritty and grungy textures that are perfect for your designs, logos, lettering, and illustrations in Photoshop, Illustrator, Affinity, or CorelDraw. I get the "Grunge," but where does the "Luxury" come from? Optimized for t-shirt designs. Adding this kind of texture means less ink, resulting in softer, more luxurious t-shirts! Will the textures work for designs other than t-shirts? Absolutely. They will work with anything you can dream up in Illustrator, Photoshop, CorelDraw, Affinity Designer & Photo, and almost any other graphic design software. • Photoshop Brush - Load the brushes into Photoshop, Affinity Designer, or Affinity Photo. Select a brush, choose a color, and paint texture right into your design. 4000 x 4000 pixels. Extra versions for all versions of Photoshop CS through CC. • Regular TIFF - Perfect for use in Photoshop and Affinity Photo. 4000 x 4000 pixels. • BITMAP TIFF - Ultra high resolution: 12,000 x 12,000 pixels. Best for Adobe Illustrator. These files are ideal for screen print production & color separations using Illustrator because they have no greyscale; only black or white pixels. When viewed in Illustrator, Bitmap Tiff files have automatic transparency and can easily be assigned any color. The newest sequel to the Original T-Shirt Design Master Collection is here! A huge bundle collection of T-Shirt Design Resources, Templates, Textures, Workshops & Tutorials. And the best part: It's STILL GROWING! One new product will be added to this bundle each month in 2018! Everyone who purchases will receive monthly email notifications with links to download the newest items added to this bundle (at no extra charge). Make your t-shirt designs look real in Illustrator, Photoshop, CorelDraw, and Affinity Designer. Add texture to your designs in Illustrator, Photoshop, CorelDraw, and Affinity Designer. Use these vector gradients to add a color fade to your logos, lettering, t-shirt designs and illustrations in Illustrator, Photoshop, CorelDraw, and Affinity Designer. Paste your designs into these Photoshop templates for instant effects. Start your t-shirt designs with these vector elements. Excellent for making logos and designs in Illustrator & Photoshop. Online Instruction, Tips & Techniques. Watch any time. 9 Product Tutorial Videos Showing how to use the textures & templates. The various analog and digital tools you will need to create t-shirt designs. Students should have some prior knowledge of Photoshop and Illustrator. Skills such as how to scan images into Photoshop, an understanding of layers, and how to size images. This is not a basic entry level course for Photoshop and Illustrator. The T-Shirt Design Master Collection is my largest bundle of t-shirt design resources: 64 t-shirt mockup templates, 605 textures for Photoshop and Illustrator, 25 logo templates, as well as T-Shirt Design Workshops 1 & 2. Just copy & paste your design into this template to apply an instant ink stamp effect. Perfect for adding some interest to otherwise plain & simple logos or lettering. These cracked ink "Plastisol" textures will make your t-shirt graphics look washed & worn like and old vintage tee. Plastisol textures are ideal to add a "thrift shop" look to your real-life t-shirt screen print designs, as well as your digital portfolio. Photoshop and Illustrator compatible. Making your t-shirt designs look real is the best way to show your designs before sending them off to be printed. These templates will help your clients and customers visualize your designs. You can even change the fabric color, add a custom neck label, and warp your graphic to match the wrinkles in the fabric. These templates are formatted for Photoshop and Illustrator, but also work with CorelDraw and Affinity Designer & Affinity Photo. Good news for Affinity Designer, Affinity Photo, and CorelDraw users! My apparel mockup templates can be used in Adobe Photoshop, Adobe Illustrator, Affinity Designer, Affinity Photo, and Corel Draw! Affinity Designer does not have a displacement map function (to warp your graphic). But all other mockup features work. Affinity Photo, however, DOES have a displacement map function. It works best if you apply it to your graphic with a subtle amount of warping. The Adobe Illustrator AI versions of the templates can be opened in CorelDraw. This applies to all of my men's & women's apparel mockup templates, except for Apparel Mockup Templates Variety Collection (because they are Photoshop only). All mockup features work, except for the displacement map warping. CorelDraw has a displacement map feature, but I haven't been able to get reliable enough results to recommend this feature. This video shows how to use Opacity Masks in Adobe Illustrator to add texture to your t-shirt designs, logos, and lettering. It also covers how to export your design as a transparent PNG, which is a preferred file format for Direct-to-Garment (DTG) printing, Print-on-Demand (POD), and Amazon Merch. In case you missed it, here's a video showing how to use textures, layer masks, and brushes in Adobe Photoshop. Use Photoshop brushes and Layer Masks to add texture to T-Shirt Designs, Logos, and Lettering. I've been designing custom lettering for years. But until now, I've never converted these designs into a functional font that can be typed out with a keyboard. 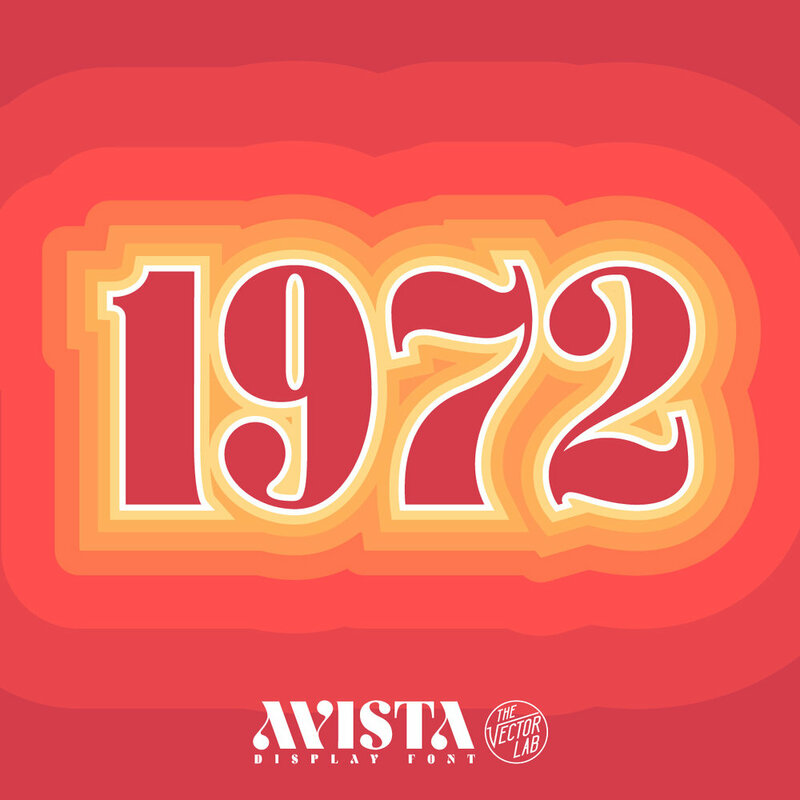 Today I am thrilled to announce the release of my first font, called AVISTA! It has a unique mix of retro, modern, and classic styles that will instantly spice up your designs. It works well on a plain background, incorporated into a logo, as a type-based t-shirt design, or layered on top of photos (my favorite method). Go here to find out more about AVISTA. Sneak peek of a new font under construction. A set of 31 vintage cracked paint textures that will give your designs a weathered and rustic look. Snap Crackle Textures is sourced from antique cracked paint surfaces like old signs, walls, and furniture. This is just what your t-shirt designs, logos, lettering, and illustrations need for that added element of interest. Optimized for Photoshop and Illustrator, these textures will also work in virtually any other graphic design software package. Halftone Automator (a "smart PSD" template for Photoshop) will add vintage-style halftone effects to your designs, logos, and typography. This template takes plain designs and instantly knocks a transparent halftone pattern right through your design. The Halftone Automator Photoshop PSD template (4000 x 4000 pixels). 47 built-in halftone patterns with various dot sizes and density.